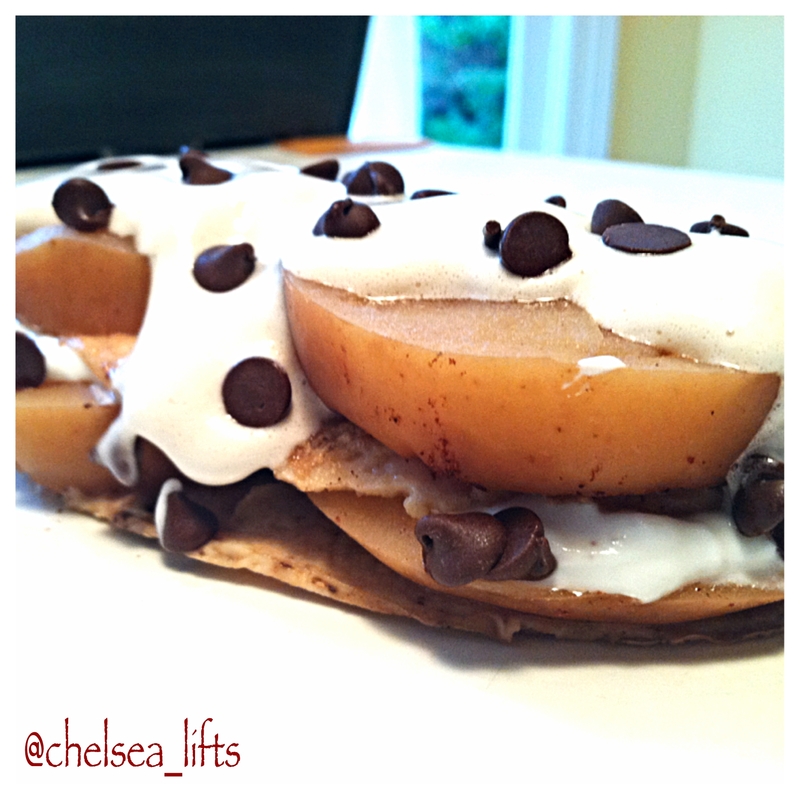 Egg-White Peanut Butter Crepe stuffed with Cinnamon Baked Apple slices, Yogurt Cream, Homemade Marshmallow Fluff, and topped with vegan Carob Chips. For Fluff: See my Fluff Recipe in my profile. For Baked Cinnamon Apple: Cut the top off of a medium apple (whatever flavor you would like, I used a Gala) and core it. Place in a small ramekin and fill bottom with 1/4" of water, also baste the apple with water and then sprinkle cinnamon over the whole apple. Cover with aluminum foil and put in the oven on 350F. Allow apple to bake for 10 minutes and then remove from oven and baste with water from the bottom of the ramekin (this prevents the apple from drying out while baking). Place back in oven and set timer for another 10 minutes. Repeat the previous steps to baste again. Place in oven one more time for 10 more minutes (while it is cooking this last time you can prep your other ingredients such as the crepe). After this last ten minutes, check and see if the apple if baked all the way through, if it is remove from the oven, turn off oven, and place to the side to cool for a few minutes. If not, place back in oven until cooked through. For Crepe: Mix PB2 with Egg Whites and cook on stovetop on medium heat in a medium skillet, making sure that the liquid spread entirely so that the crepe will be as thin as possible. Once it is cooked on the bottom, flip either in the skillet or with a large spatula. Once cooked through, turn off heat and place crepe on your plate. To Assemble: Cut slices of apple and place them on one half of the crepe, whisk the yogurt to get it fluffy and then spread on top of the apple. Fold the other half of the crepe over to that it covers the apples and yogurt. Place more sliced apple on top. Cover the top of those apples in Marshmallow Fluff and sprinkle with Vegan Carob Chips!